At the end of six years as the head of the Holy Ghost Fathers, during which he attempted to restore the religious spirit and sound doctrine in his congregation, Archbishop Lefebvre resigned from his office in 1968. For many years he had had requests from young men who aspired to the priesthood but could not find a seminary that had preserved the Roman spirit. Although he sent around 20 of them to Rome, the experience proved to be disastrous. In 1968 the red Communist flag was flying over the French Seminary! Given the degradation of the priestly ideal that he noticed from 1960 on, it seemed to him that he had to become personally involved and hand down the heritage that he had received at Santa Chiara, in the French Seminary. Now relieved of all important duties, he responded to the clear promptings of Providence: first by sending candidates to the University of Fribourg, in Switzerland, where the formation was still serious, then by founding a traditional seminary himself. On June 6, 1969, he obtained from the local ordinary permission to open an international seminary in that town. On October 13, nine candidates entered it: they took courses in philosophy and theology at the university and led a common life in a rented house on a street called, Rue de la Vignettaz. The following month, Archbishop Lefebvre presented to his seminarians his plan for a society of common life without vows, which would prevent them, after their ordination, from being scattered among the dioceses, at the mercy of superiors imbued with new doctrines, while the wind of revolution was blowing everywhere. 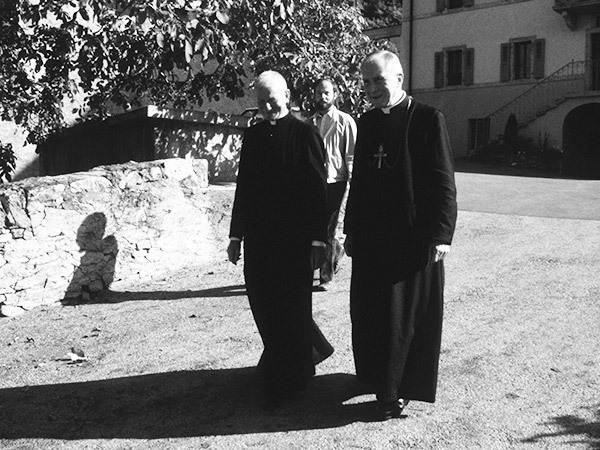 On November 1, 1970, the Bishop of Fribourg approved the statutes of the Priestly Society of St. Pius X and erected it in his diocese as a pious union. That same year, 1970, saw the beginnings of the International Seminary of St. Pius X in Econe in Valais, where liturgical life and teaching according to St. Thomas Aquinas developed in conformity with the constant directives of the popes. The Society placed at the heart of its formation of future priests devotion to the Holy Sacrifice of the Mass and the worthy celebration thereof according to the traditional rite codified by Pope St. Pius V. The Society is not a contemplative community, but is “essentially apostolic because the Sacrifice of the Mass is too” (Statutes). By virtue of his experience in Africa and of the marvelous fruits of the Mass, Archbishop Lefebvre was convinced that “the Mass is the heart of theology, pastoral ministry and life of the Church.” In that reality of the sacrifice of the altar, which is simultaneously temporal and eternal, the mysteries of the Incarnation and the Redemption are accomplished, bringing about the ransom of souls and the spiritual, moral and even physical transformation of society. The priest, through the character of the sacrament of holy orders which is imprinted on his soul, is another Christ, who finds in the daily offering of the Holy Sacrifice his primary apostolic activity and the daily encouragement to immolate himself, which is the prerequisite for his sanctification. For this reason the first goal of the Society is the formation of priests and it is placed under the patronage of St. Pius X, because the first and most basic concern of that holy pope was the formation of the clergy in doctrinal integrity and sanctity of morals. The canonical erection of the Society of Saint Pius X was approved on November 1, 1970 by Bishop Charriere. "Recognized by the Church as a Society of Common Life without Vows and as a priestly society, our Society is grafted onto the trunk of the Church, drawing its sanctifying sap from the most authentic tradition of the Church and from the living and pure fountains of its sanctity."